Nearly one hundred percent of all artichokes grown commercially in the United States are grown in California. While artichokes are a small industry compared to broccoli, grapes, and lettuce, they add over $50 million to the economy of the state and a whole lot of panache. Approximately 75% of the state’s total acreage lies within Monterey County. Nowhere else in the world is there such a concentrated area of production, consistently yielding nearly 4 million cartons of delicious artichokes every year. Recognizing that no other vegetable grown in Monterey County can claim such prominence, the Board of Supervisors of Monterey County declared the artichoke to be “the Official Vegetable of Monterey” in 1986. The heart of the artichoke industry is located near Castroville in Monterey County and Castroville proudly proclaims itself to be “The Artichoke Center of the World” on a huge banner that spans the main street. Smaller banners depicting artichokes decorate the light poles and a restaurant/fruit stand called the Giant Artichoke actually has a giant artichoke for photo ops. Surrounded by thousands of acres of silvery artichoke plants, the town pulls out all stops to celebrate its major crop in May with a 2-day festival. A native of the Mediterranean, the artichoke can be grown as a perennial or annual crop. It is a member of the thistle tribe of the sunflower (Compositae) family. In full growth, the plant spreads to cover an area about six feet in diameter and reaches a height of three to four feet. Its long, arching, deeply serrated leaves give the plant a fern-like appearance. Historically, the Green Globe cultivar has accounted for most of the production but that has changed as new varieties have come into production and, as of 2007, annuals have overtaken perennial production. The “vegetable” that we eat is actually the plant’s flower bud. If allowed to flower, the blossoms measure up to seven inches in diameter and are a beautiful violet-blue color. The size of the bud depends upon where it is located on the plant. The largest are “terminal” buds produced at the end of the long central stems. These are the ones you are most likely to see from the car during a springtime drive throughout the area. Buds are smaller lower on the stem. The main propagation method for planting Green Globe artichokes is with root sections attached to basal stem pieces. These cuttings, which are often referred to as “stumps,” are obtained from established fields scheduled for replanting. The newer varieties, which are annuals, are grown from seeds that are nurtured in a greenhouse and transplanted as seedlings in the field. 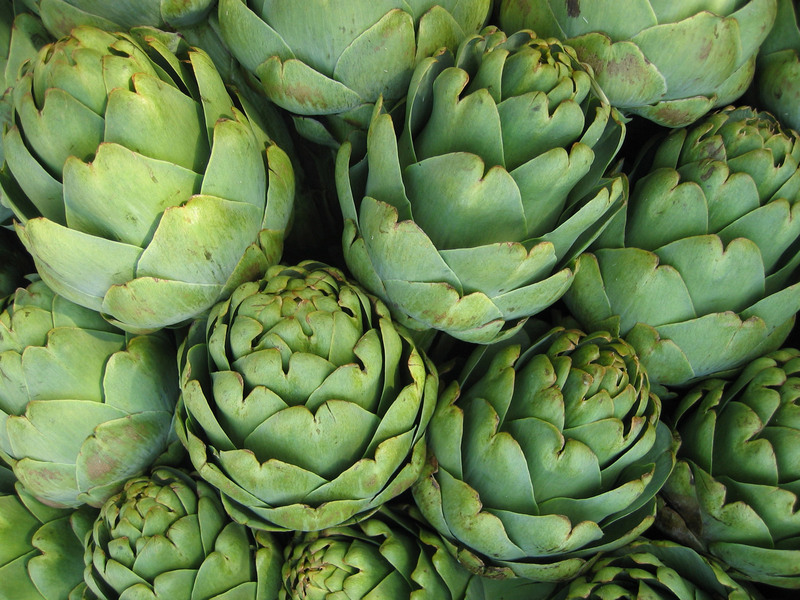 Today, annuals are the main propagation method for the artichoke industry in California. Green Globe artichoke fields are maintained in perennial culture for five to ten years. Each cropping cycle is initiated by “cutting back” the tops of the plants level to the ground or several inches below the soil surface to stimulate development of new shoots. While California artichokes are available throughout the year, peak season is March through May and again to a smaller degree in October. They are an extremely labor-intensive crop as the harvesting is done entirely by hand; and, because artichokes on the same plant mature at different times, the same field will be harvested every seven days during peak season. Labor represents 40 to 60 percent of the growing costs. 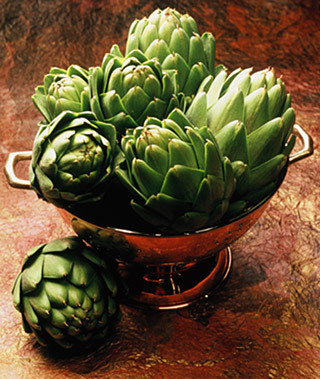 The Green Globe artichoke prefers temperate climates — never too hot or cold. The central coast of California, where winters are relatively frost-free and summers are cool and moist with fog, is an ideal growing area. Here, too, are deep, fertile, well-drained soils that promote maximum root development. Most of the newer annual varieties do prefer a Mediterranean climate but are more tolerant of weather fluctuations and can be planted in other areas at differing times. This means that artichokes can be brought to market all year long to satisfy eager artichoke aficionados. The artichoke makes no concessions to those who want a quick meal. So, in this age of “fast food” and “quick fixes,” what keeps this commodity growing? Serious artichoke eaters will tell you that the reason for eating an artichoke is its unique, nutty flavor, their health benefits and they are just plain fun to eat. Most people cook the whole artichoke, and slip each leaf petal, one by one, through their teeth until they reach the delectable heart. Children love them because the get to eat artichokes with their fingers! The artichoke is fun to eat, and it’s good for you. One medium sized artichoke is a good source of vitamin C, folate and potassium. It’s low in sodium, fat-free and a dieter’s delight at only 25 calories. In addition to eating them “straight up,” many consumers have discovered that artichokes also make excellent additions to stir-fry and pasta dishes.